This spectacular unit is on the second floor, accessible using the elevator or outside stairwell. This unit has been thoroughly updated with plank tile flooring, and new kitchen and baths, making it one of the nicest units at Fisherman's Cove. The kitchen has granite countertops with glass tile and tumbled marble backsplash, and modern appliances including refrigerator with through the door ice/water, glass top range and oven, dishwasher and microwave. The kitchen is fully equipped including a range of small appliances. The dining area has seating for four and is right off the kitchen. The living room is well appointed with leather couch and loveseat, large flat panel HDTV and an amazing view out to the lanai and the Gulf. The air-conditioned lanai has floor to ceiling glass sliders overlooking the Gulf of Mexico and the beach below. Sleep at night with the ocean surf right outside your window! The master bedroom has a bay window overlooking the Gulf and beach below. It has a king-size bed, large HDTV, walk-in closet, and en suite bathroom with a large tiled shower. The second bedroom has a queen-size bed plus a twin-size bed, flat panel HDTV and a large window overlooking the bay and boat docks. Note: Rates based on occupancy of 4 - additional occupants $70/week up to max occupancy. Had a wonderful time, one of the best vacations!!! Be sure to come back to add to those wonderful memories! Been staying at Siesta Key for years...but never at Fisherman's Cove. Excellent place with terrific views of the Gulf & Bay! Can't wait to come back!!! Thank you! William, we look forward to having you back! Thanks for the review! This is our third time staying at this beautiful condo with the Gulf out the back door and Little Sarasota Bay out the front. Owners Linda and Al make sure the condo is clean and has everything you need. The only negative thing I would say is that the Wi-Fi is spotty at best and only available in the lanai. We look forward to returning!! Sarasota is advertised as "Paradise" and this place truly is. If you want to be close to the beach and gulf, and enjoy seclusion, than this is it. We started out staying here for two weeks, six years ago, and now we are staying for at least five weeks each year. 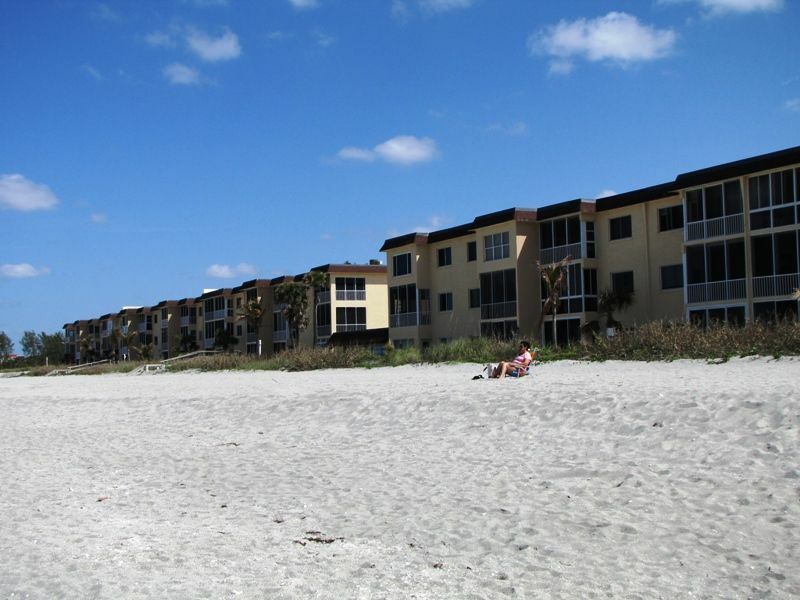 We love it and have easy access to all that Sarasota has to offer. For us, it is the beach, shopping, golf, Orioles Spring Training, and a wide variety of restaurants. The condominium is very well maintained and the owners have become personal friends. The sunsets, directly out the backdoor, are breathtaking and my wife has hundreds of sunset photographs. We have checked Florida's West Coast and you cannot get any closer to the Gulf than Fisherman's Cove. We love it and look forward to our vacation the entire year. This is really a very relaxing place to vacation. We have been here several times and absolutely love it. Being able to walk out the back porch and onto the sand of the Gulf Coast is glorious. The sunsets are awesome. It is located away from Florida's hustle and bustle, which is the kind of relaxation we are looking for. The owners are wonderful and their condo is spotless and well-equipped. Resident opera and ballet companies, Jazz, Asolo Theatre, Mote Marine Aquarium and Laboratory, Ringling Museum of Art, VanWezel Live Theatre, Orchestras, Famous entertainers.